it’s all about the cake – Helen, Naturally! What’s better than an entire day of rain? The kind of rain that is blowing into you from the side therefore making your umbrella useless. The kind of rain that has your jeans soaked from the knee down when going to your car after work because the water can’t drain away fast enough. Don’t close the window yet because you think I am crazy. I promise you will not be disappointed in my question. My “inner” trainer will be greatly disappointed! 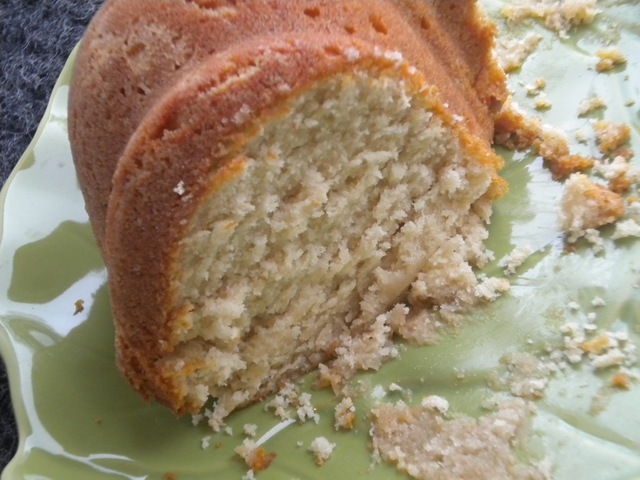 It started out with my wonderful buttermilk pound cake. This cake is delish. You must bake it tonight. Like now. Hurry, go preheat the oven, send someone to the store for any needed ingredients. You can thank me later. add the eggs to the butter mixture one at a time. start adding the flour to the mixture, alternating with buttermilk, until mixed well. spray and flour a bundt pan. pour the batter into the pan, smooth the batter, bake in teh oven for approximately 1 hour and 10 minutes. Go put on a nice pot of coffee and enjoy a wonderful slice with someone you love. 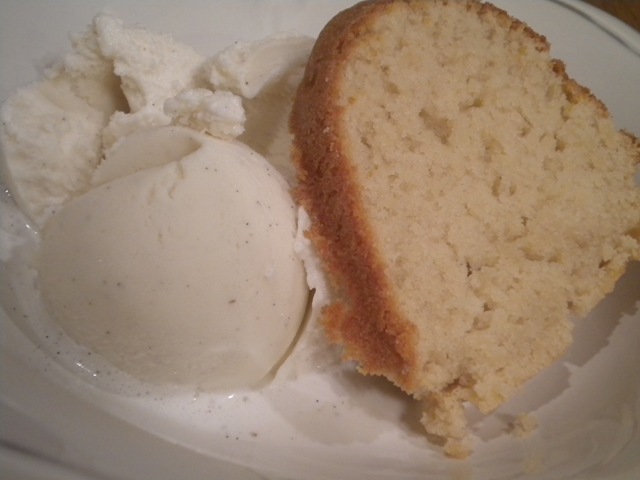 Or even better grab a nice warm slice and pair it with some vanilla bean ice cream. Cake doesn’t end there. Oh no, no it doesn’t. Now the next one, regretfully, I can’t give you a recipe for since I purchased this one. Several comments have been made about not knowing what king cake is. Let me enlighten you. In the southern United States, the tradition was brought to the area by colonists from France and Spain and it is associated with Carnival (also known as Mardi Gras), which is celebrated in the Gulf Coast region, centered on New Orleans, but ranging from the Florida Panhandle to East Texas. 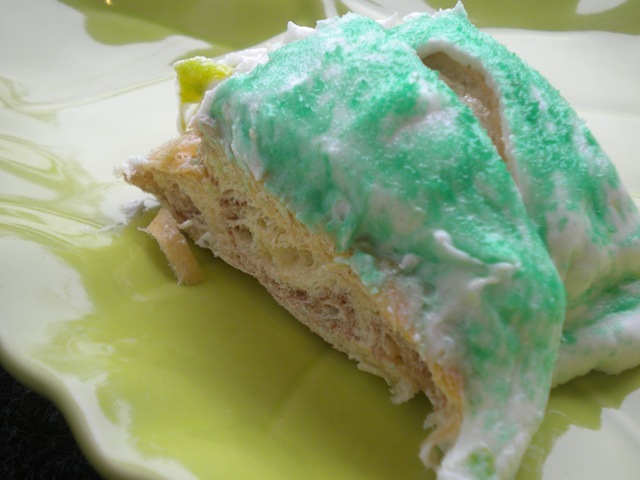 King cake parties in New Orleans are documented back to the eighteenth century. 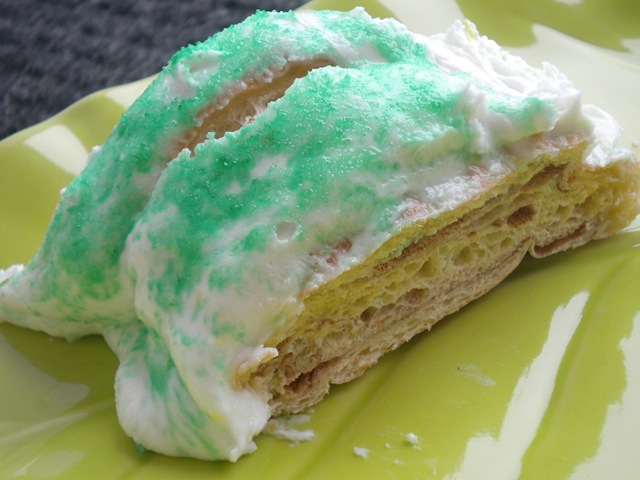 The king cake of the New Orleans Mardi Gras tradition comes in a number of styles. The most simple, said to be the most traditional, is a ring of twisted bread similar to that used in brioche topped with icing or sugar, usually colored purple, green, and gold (the traditional Mardi Gras colors) with food coloring. 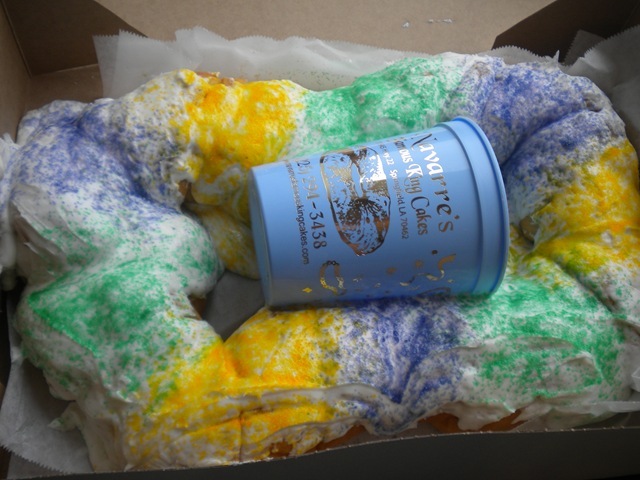 Cajun king cakes are traditionally deep-fat-fried as a doughnut would be, and there are many variants, some with a filling, the most common being cream cheese and praline. This is a big tradition in Louisiana, we love our Mardi Gras. Remember when I mentioned that Kohl insisted on a king cake, well we got one. 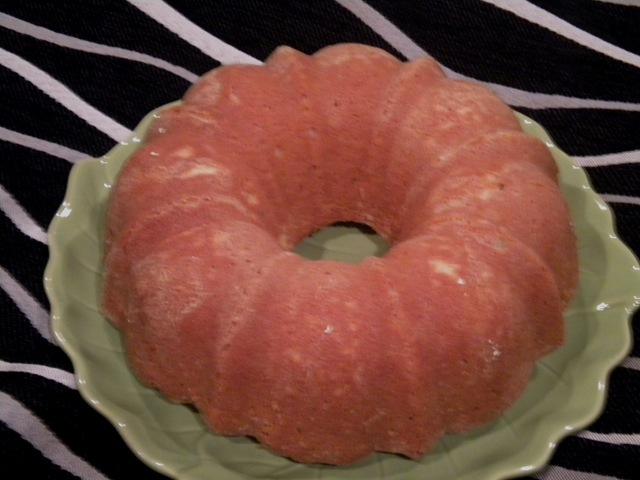 There are different variations of this luscious cake, ours is more like a doughnut since it is from the doughnut shop. Many places make there king cakes more like a cinnamon roll ring. These are tasty as well but not as light and fluffy. And yes they come with many fillings: cream cheese, bavarian cream, cherry, strawberry, praline pecan, chocolate, coconut cream, etc. You can get them with mixed fillings in some bakeries. A favorite of mine is called Zulu cake which is a mixture of chocolate and coconut. You can also get some very unique fillings such as lemon and sweet potato. We of course had to stick with just a cinnamon king cake, no filling. Oh it was so hard to pass up that praline pecan. But kohl is really enjoying his king cake. He isn’t big on the fillings. p.p.s. if I don’t post tomorrow send help. I will be in a sugar/cake comma and will need immediate attention. Previous postneed a quick dinner idea?